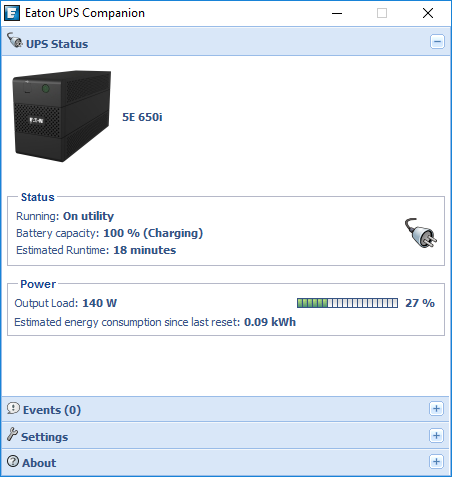 When using an Eaton 5E 650i UPS with the proprietary Eaton UPS Companion, there is an additional value named "Output load" which seems like useful information to have via nut. Is this value accessible via nut? I would think that it should be ups.power.nominal * ups.load / 100%, but the math doesn't quite work out. Maybe ups.power.nominal is a VA rating, and there is a lower max wattage that we are not reading? @aquette do you have any newer protocol documentation? I don't know if the 5E follows the same conventions as the original MGE USB HID spec from 2001. Let me know if you require any additional data sampling. sorry for the silence, I had this patch ready since a month, tested on a 5E, but still not yet non-regression tested on other units (providing the missing data on 5E). I'll try to do this test today to then push into the mainline of NUT. In the meantime, if you can test also on your side, that's always welcome.